There’s a writeup for Ravenholme, a creepy gothic campaign which sounds quite interesting. People wanting to know more could delve into the archive (requires login). A couple of pieces promoting larp concepts which I don’t think happened. Its easy to come up with a campaign concept, but harder it implement it. And that’s still the case. A review by @Ryan_Paddy of Flight of the Hindenburg’s initial run at KapCon 2007. The game has since been rerun a couple more times, and IMHO stands up well. It’s one of the stronger theatreforms KapCon ran, and well worth playing if you get the opportunity (I have vague hopes of taking it to Phoenix sometime, if the con grows large enough to support it). @Wulfen_David talks about (physical) immersion vs suspension of disbelief. Nowdays, we push for immersion as much as we can, with high-quality costumes and a lot of set-dressing, because its seen as aiding suspension of disbelief: its easier to act as if you’re in not-quite-Paris or a norse longhall if the players and set look the part. Plus, it makes for cooler photos afterwards. Read it through. Anything else strike your eye that’s worth commenting on, which makes you go “I wish I’d played that” or “this issue is still around, but…”? Then speak up! (Also, if you’re interested in the old games mentioned in it, info can be found in the archive (requires login)). 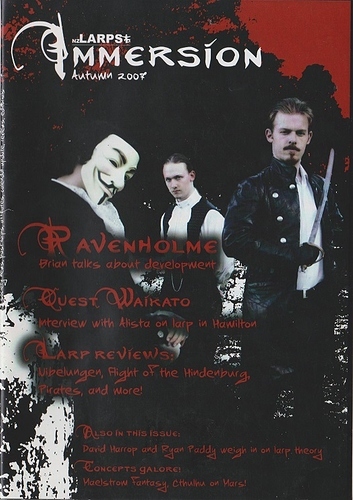 That Flight of the Hindenburg review is also interesting because it came just before several big changes in NZ larp. After that review, we ran the game at the first Chimera, which was our first larp convention nationally (as far as I know). Because pregen larps had not been nearly as common in Auckland as Wellington, in some ways when @Anna_K started Chimera, Auckland players and writers were jumping on it as an “exciting new thing” for our scene imported from Wellington. Also, after this the Auckland and Wellington communities started travelling to attend each other’s games, and really merging to a large extent. That was an interesting meeting of sub-cultures. It’s funny that while Chimera is now on hiatus in Auckland, Hydra is carrying the flame in Wellington, back where the popularity of pregen larps first spread out from. Will pregens swing back around into popularity in Auckland? Or perhaps something else - linear games? walking games? battle games? camp-out fests? Right now weekend-game campaigns are so popular, but can we also see the beginnings of any other trends? Are larp trends like fashion, always moving and cycling to keep things fresh? There’s a lot more about Chimera in later issues Its something which is IMHO an absence from the NZ larp scene. While Hydra is carrying the flame for pre-gen theatreform, its half the size, and doesn’t seem to be quite the community melting pot that Chimera was. I can’t speak on what’s fashionable in Auckland (other than “smaller games, rather than One Big Game”, which is an obvious trend), but in Wellington its the same mix of theatreform and campaign larp we’ve had for a while. We have some afternoon-format (non-contact) campaigns, which have their own niche, and there seems to be some desire to explore this format a bit more from people who don’t want the scale or hassle of a full weekend. But ultimately what gets run is up to those willing to GM, and that’s a fairly small pool down here. I gues sin Auckland its a question of what the GM pool wants to spend their time championing. I feel like the campaign scene in Wellington has been somewhat inspired by the Auckland approach to campaigns, just like Auckland’s pregen scene was inspired by Wellington’s. A nice exchange.